A society is not “free” merely because the freedoms the people are doing away with are those they voted at the last election to do without. And by the way, I've about had it with this “greatest generation” malarkey. You people have one stock market crash in 1929, and it takes you a dozen years to go get a job. Then you wait until Germany and Japan have conquered half the world before it occurs to you to get involved in World War II. After that you get surprised by a million Red Chinese in Korea. Where do you put a million Red Chinese so they'll be a surprise? You spend the entire 1950s watching Lawrence Welk and designing tail fins. You come up with the idea for Vietnam. Thanks. And you elect Richard Nixon. The hell with you. 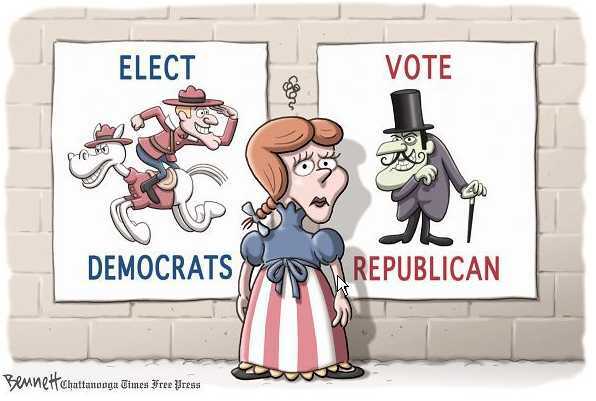 Give voters a choice between a Republican and a Republican, and they will choose a Republican every time. In 1929 the wise, far-seeing electors of my native Hereford sent me to Westminster and, two years later, the lousy bastards kicked me out. In a democracy, the votes of the vicious and stupid count. On the other hand, in any other system, they might be running the show. In our system, at about 11:30 on election night, they just push you off the edge of the cliff and that's it. You might scream on the way down, but you're going to hit the bottom, and you're not going to be in elective office. Once there were two brothers: one ran away to sea, the other was elected Vice-President- and nothing was ever heard from either of them again. Voting is like driving... you choose “D” to move forwards and “R” to go backwards. The cat runs a tight ship.